BIESPA recruited district staff and family members to join the Bainbridge Schools Foundation in the 2012 July 4th Parade. 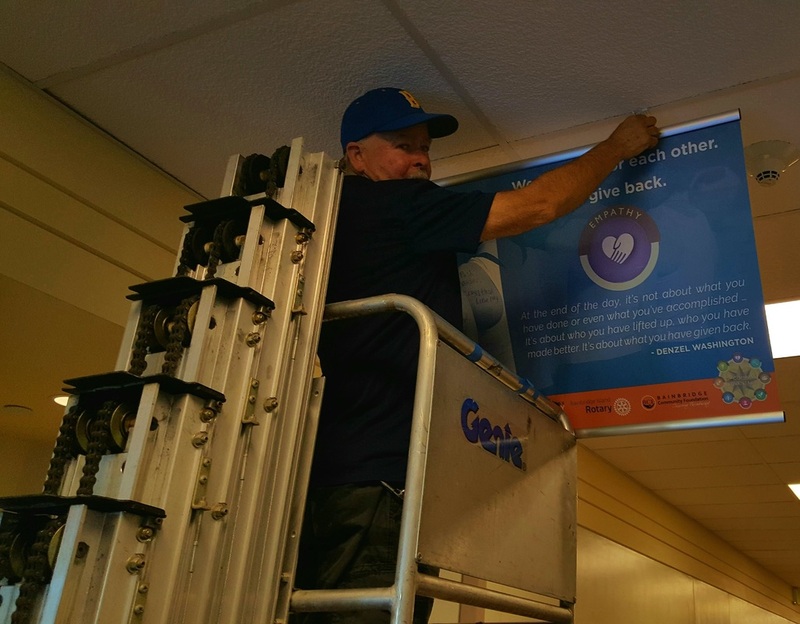 BHS Custodian and union Shop Steward for all district custodian, Earl Williams, hangs banners in the halls of the high school just before the first day of school. The banners have inspirational quotes from famous people and photos of Bainbridge students. Photo courtesy of Principal, Duane Fish. Marvel Loria, who has driven a bus for the district since 1985, casts her ballot to approve the contract agreement reached with our administration in January 2016. She joined 94% of her coworkers who voted overwhelmingly in favor of the collective bargaining agreement at the ratification meeting held on February 3rd, 2016. The BISD School Board voted to accept the contract on February 11 and members will see the new wage rates reflected in their paychecks at the end of February, 2016. BIESPA members, and some of our certificated colleagues, turned out in force, wearing black, at two school board meetings in December 2015 and January 2016 to show their support for our bargaining team's efforts to win increased wages and other contract improvements. Candy Lynn (bus driver), Marie Zharinov (BHS para) and May Sperber (Ordway Food Service) marched with the Bainbridge Schools Foundation in the 2015 Grand Ol' Fourth parade in Winslow. (below) Holding the BIESPA banner high, May Sperber, Marie Zharinov, Mike McCloud and Debbie Harrigan. Sitting in front, Lisa Draper and her grandsons waiting for the parade to start. Also marching on July 4th were Mike McCloud, Debbie Harrigan and Lisa Draper and her two grandsons. BIESPA members Marcia Millican (Ordway), Stacie Boyd (Wilkes), May Sperber (Ordway) and Mike McCloud (BHS) turned out on June 9, 2015 to cheer for our Bargaining Team at their first meeting with district bargainers. 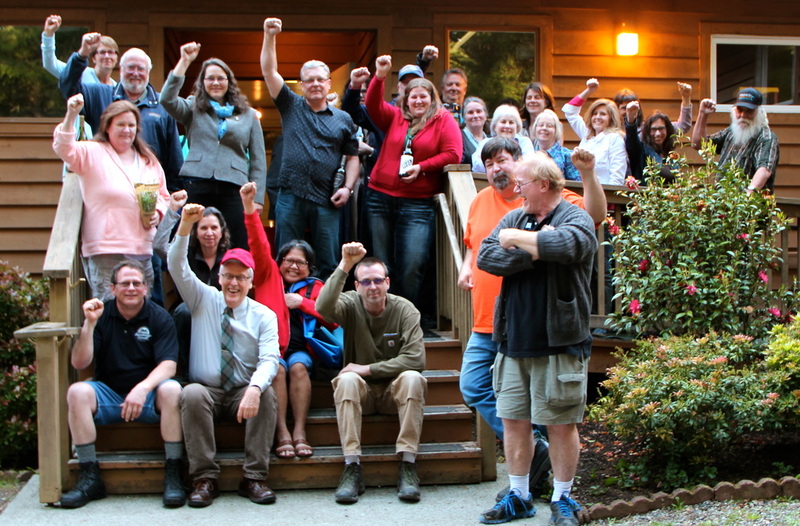 Some of our bargaining team members: Back Row, from the left, Lydia Scheiber (Tech), Mark Gurtler (Para), Randy Paddock (WEA Uniserv). Front row, Becky Beemer (Secretary), Lisa Draper (Para) and May Sperber (Food Service). Other members include Steve Brown (Transportation), Bill Ackerman (Maintenance), Janice Shankland (Tech) and Earl Williams (custodian). Thank you all!!! An online survey of BIESPA members revealed 85% of respondents supported the BIEA walkout on April 30, 2015. 84 classified employees of BISD (47% of members) took the time to answer 5 questions about the one-day strike. Although there was some confusion and disruption, the walkout had little impact on year-round classified employees and extended the school year by one day for most school-year (180 day) employees. Classified employees turned out early Thursday (3/30/15) to support the walkout by teachers. (Left to right) Ailene Isaf (Sakai), Lisa Draper (WMS), and Carolyn Colvin, Susie Stricker and Peg Dight (all of Sakai) joined scores of other staff, students and parents to give a supportive send-off for colleagues heading for Olympia to lobby the state legislature to increase funding for education. Fifty people attended our April 29th meeting, including two members or the BISD School Board. BIESPA members came to hear from our Bargaining Team, discuss the walkout, eat pizza and win door prizes. (above) Bainbridge School Board member Sheila Jacubik (left) listens to Sherri Dyer talk about her job at our Spring General Membership meeting. Sherri is BIESPA Treasurer and works in the kitchen at BHS. Members of the Bargaining Team shared the results of their survey. Janet Shankland, veteran number -> cruncher for our Team, presented a slide show about the results of the survey and the priorities to be pursued. (below) First-time delegates, Ana Rosen and May Sperber, demonstrated for increased education funding in Olympia - April 25, 2015 They joined Mike McCloud as BIESPA representatives at the the 2015 WEA Rep. Assembly in Bellevue. (above) BISD Superintendent Faith Chapel met with a joint meeting of our Building Rep. Council and Bargaining Team - March 18, 2015. This is the first time anyone can remember a superintendent meeting with the broad leadership of our union. 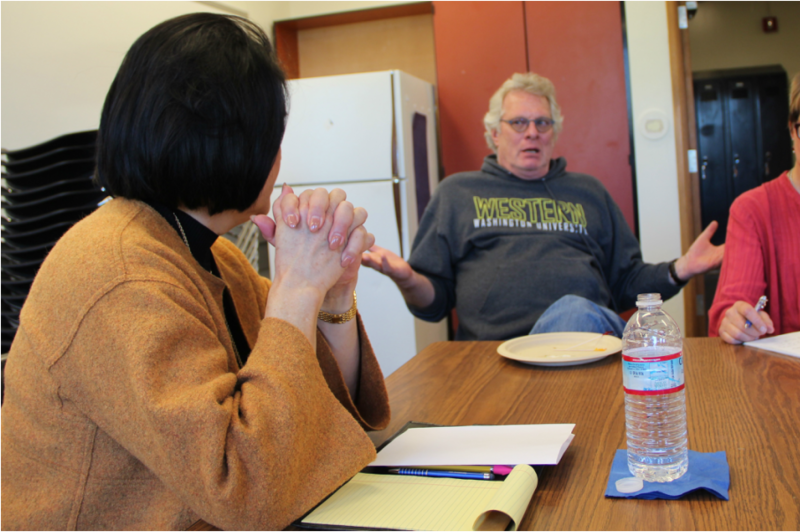 Superintendent Chapel listened as Sakai Para, Mark Gurtler, talked about the challenges he faces at work. Executive Director of the Bainbridge Schools Foundation, Vicky Marsing, spoke to our members at the 2014 Fall General Membership meeting. Anita Marquez (past Building Representative) and Dave Flieder (current Building Representative for Grounds, Maintenance and Tech) arrived early to help set up for the Meeting. For the past several years Anita has arranged rental of the Filipino American Hall as the location of our General Membership meetings. At the BIESPA 2013 Spring General Meeting, Vice President, Lisa Draper explained a new vision plan that members eventually rejected. This is an option that had been developed by the Benefits Committee that Lisa works on. Candy and Nick Lynn both work as bus drivers. They regularly attend BIESPA's General Membership meetings and Candy is one of the Building Representative serving Transportation. BIESPA R.A. delegate, Carrie Shipp, delivers her card for education funding to Representative Sherry Appleton, who represents the 23rd Legislative District. Sherry was one of a score of legislators who came out to show their solidarity with WEA members. BIESPA's 2012 Bargaining Team crunches some numbers. Our Bargaining Team has put in countless hours over many months surveying members, setting priorities, researching, working with experts at WEA and meeting, face-to-face, with district administrators to negotiate a new contract. They are (left to right) Dave Fricke, Janet Shankland, Lydia Scheiber and Bill Ackerman. We regularly send delegations of our members to Olympia to advocate for "ample funding for basic education", as guaranteed under the Washington State Constitution. From left to right, Mark Gurtler (paraeducator), Martha Paterson (WEA Olympic WEA-PAC Coordinator), Bob Houston (custodian), JoEllen O'Reilly (paraeducator) and a mystery woman who looks very nice. They are standing in front of the Capital Building in Olympia. On the left is our 23rd Legislative District Senator, Christine Rolfes, who met with WEA Olympic Council members including BIESPA members, Mark Gurtler (tall guy in the center, back row), Bob Houston (black shirt, carrying an orange binder) and JoEllen O'Reilly (farthest right). The visit took place on March 14, 2013. They also met with a number of other representatives. Cathi Holliday and Susie Stricker made get-out-the-vote calls for WEA endorsed gubernatorial candidate Jay Insee. They were joined by JoEllen O'Reilly, Ailene Isaf, Mike McCloud and a number of the certificated staff in a joint BIESPA / BIEA project. May Sperber - Food Services Co-Rep.
Ailene Isaf - Sakai Co-Rep.
Cathi Holliday - Ordway Co-Rep.
Stacie Boyd - Food Services Co-Rep.
Susie Stricker - (short) Sakai Co-Rep. The BIESPA Exec Team met on August 21, 2013 to organize and plan for the upcoming school year. Cathi Holliday, Bob Houston and Stacie Boyd display the new BIESPA banner before marching to support the Bainbridge Schools Foundation in the July 4th Parade in Winslow. BIESPA contributed about a dozen marchers to the parade. Kathy Ellison (Sakai Teacher-Librarian) and her son, Andrew, marched in the parade with their great home-made signs. On the left, leaning on the "Spirit of Sakai" sign is Sakai custodian, Bob Houston. On the right with the "Thanks for supporting our SCIENCE programs!" sign is BHS Science teacher, Louise Baxter. In the middle is Louise's sister, Carol Baxter, with her dog, "Gus Gus". All four are grateful for our community's support and want ample funding for education. 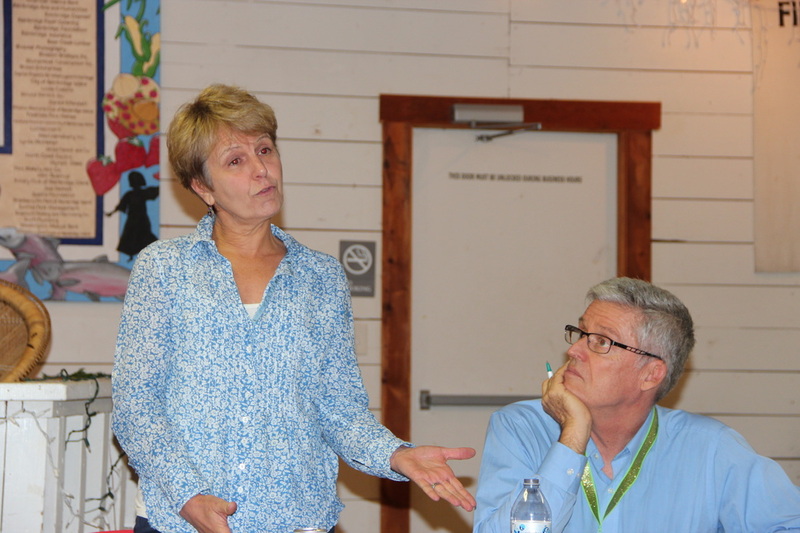 BIESPA holds two general membership meetings each year, one in the fall and one in the spring. BIESPA members Carrie Ship (Special Ed. Para at Ordway) and Elena Baker (Library Para at BHS) enjoyed hanging out at our Spring 2012 meeting. Besides pizza, door prizes and having fun, the members viewed two videos about recent struggles in Ohio and Wisconsin that revolved around worker's rights to collectively bargain their compensation and working conditions. Guest speakers were Martha Patterson, the WEA Olympic Council WEA-PAC coordinator who spoke about how crucial it is to elect pro-education representatives. WEA Political Action Committee (WEA-PAC) interviews, screens, endorses and contributes financially to candidates who will stand up to amply fund public education. If you are interested in joining WEA-PAC (it's only $2.25 each month), contact our WEA-PAC recruiter, Ailene Aisaf at Sakai, or your Building Representative. Marie Zharinov and Mary Stephens have fun hanging out at the BIESPA table at the BISD Benefits Fair. Marie is a para at BHS and Mary was a para at Woodward but now works in Transportation. The benefits fair is a good place to pick up information about insurance, discounts, and other benefits. The Benefits Fair is held at the beginning of the school year. Mary Stephens talked to BIESPA Building Rep and activist, Cathi Holliday about what issues are most important to Mary in her job. This event is a good opportunity to connect one-on-one with your union leadership and other members. Fixing a leaky faucet in the Special Ed. Dept. at BHS is only one of the amazing variety of tasks our Maintenance Department provides to keep our district running smoothly. Dave Flieder says it's his mission to solve problems and remove obstacles so that the rest of the staff can concentrate on educating our students. In addition to his job in Maintenance, Dave also serves as BIESPA's Building Representative for the Maintenance, Grounds and Tech departs and as one of three classified advisers on the District Budget Advisory Committee. Commodore Para and Building Representative, Susan Fidelman, practiced CPR on an infant in the district sponsored First Aid training class. Gourmet food at reasonable school cafeteria prices! Brian Parker manages the cafeteria kitchen at BHS. Brian, along with the rest of the kitchen staff at the high school who do an outstanding job producing great food. On this day Brian had baked fresh rolls and is turning them into bread bowls in which he served a delicious chilli with sour cream and shredded cheddar cheese. Mmmmmmm!!! Co-President Lydia Scheiber and Ordway Building Representative, Cathi Holliday traveled to Olympia for the Washington Education Association Day of Action on November 28th, 2011. They were accompanied by Transportation Building Rep., Dave Fricke, Co-President, Mike McCloud, and a bus load of teachers, administrators and community members. "Don't make any more cuts to education funding!" At no cost to BIESPA, this trip was funded by our Living Wage Fund. Carrie Shipp and Cathi Holliday shared the responsibility of being Ordway Building Reps. They were also leaders of the Organizing for Power team. And they were still smiling after ANOTHER two hour meeting??? ?